The painted dog (Lycaon pictus) is one of Africa's most endangered carnivores with less than 7,000 individuals persisting in the wild. They are a highly social species, living in packs and cooperating on everything from hunting to raising their young. Medium-sized African dog with long legs, large rounded ears, and unique patchy brown, black, white, red and yellow coat pattern. Mainly medium-sized antelope such as impala, greater kudu, Thomson's gazelle and common wildebeest. In addition, smaller animals such as dik-dik, steenbok, duiker, and warthogs. 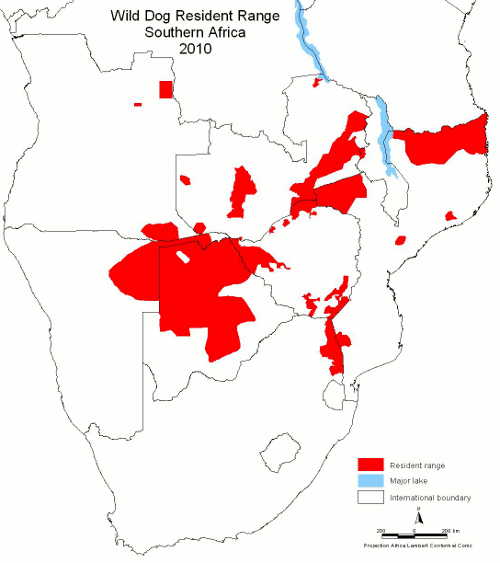 Though once distributed throughout most of sub-Saharan Africa, they have disappeared from much of this range. The largest populations remain in southern Africa (Zimbabwe, Botswana, Namibia, and Zambia) and the southern part of East Africa (Tanzania and Mozambique). The IUCN reports that there is an estimated 39 distinct subpopulations ranging in size from two to 276 mature individuals. Short-grass plains, semi-desert, bushy savannahs, and upland forest. Painted dogs hunt in packs of as many as 50 dogs and are purely carnivorous. They typically hunt medium-sized antelope and depend on their stamina and cooperative hunting techniques to subdue prey. Though the alpha male and female will generally lead the hunt, the juveniles are often the first to eat. Every member of the pack gets a share of the food; including those remaining behind to take care of the pups, those too injured or sick to participate in the hunt, or those standing guard at the kill. This close-knit social structure is particularly unique in the animal kingdom. Packs have even been observed taking turns licking the wounds of a severely injured member in order to help the healing process. Hierarchy within a pack is often established through submission rather than dominance, and all members of a pack will greet one another when reunited. Painted dog populations are endangered due to habitat loss and fragmentation, diseases spread from domestic dog populations, direct poaching, incidental death due to snare entanglement, and vehicular collisions. Though also known as the African wild dog, African hunting dog, Cape hunting dog, painted wolf, painted hunting dog, spotted dog or ornate wolf; the name painted dog has been recently adopted by conservation and zoological groups to better identify it as a uniquely classified species of canine that is neither a breed of wolf or domestic dog. The scientific name Lycaon pictus means "painted wolf" and refers to the irregular mottled brown, black, white, red and yellow coat pattern of the dogs. Painted dogs lack dew claws and are the only dog species with four toes per foot. Painted dogs make squeaks, chirps, twittering and bell like sounds to communicate with each other. However, they do not howl like wolves or domestic dogs. Although these unique social animals are charismatic and could be popular conservation targets, the species is currently in decline throughout its range due to a number of factors including human-wildlife conflict related to misperceptions about the dogs' threat to humans and livestock and incidental mortality from snares, roads, and disease. With their numbers spread out in small pockets mainly in Tanzania, Zimbabwe, Botswana and South Africa, immediate conservation action to protect surviving packs has become a top priority. With a current population of 500 individuals, the painted dog population in Zimbabwe makes up one of the last remaining strongholds. 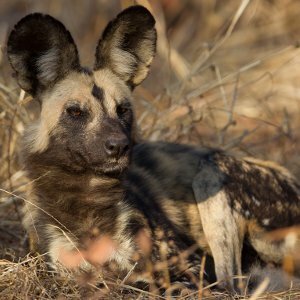 Two of the regions in Zimbabwe with the greatest potential to support a growing painted dog population are the Hwange National Park and Victoria Falls area. 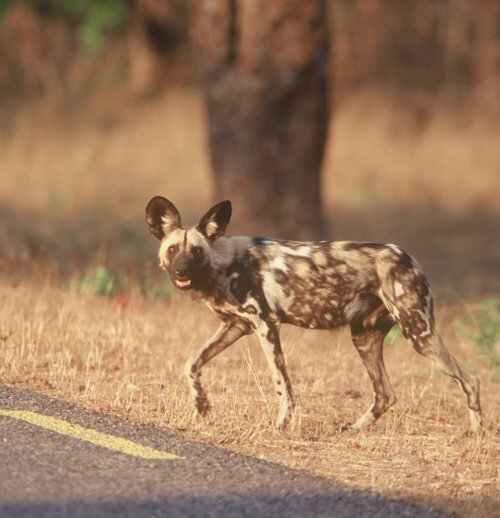 Despite an abundance of ecological resources, painted dogs in these vicinities have faced tremendous difficulty with continued threats from human-induced fatality resulting from snare wire entrapment and vehicle collisions. There is an immediate need for conservation support, but most people do not know much about painted dogs and even wildlife conservation audiences are sometimes unaware of their status or major threats facing wild populations. The Painted Dog Protection Initiative (PDPI) aims to reduce incidental mortality of dogs by facilitating the re-design and manufacturing of effective anti-snare, reflective collars, and to increase awareness of the species by expanding educational efforts. To achieve these goals, we've partnered with the in situ conservation groups Painted Dog Conservation (PDC) and Painted Dog Research Trust (PDRT) in Zimbabwe and the Wildlife Conservation Network (WCN) in the United States, and are collaborating with the Houston Zoo and Dogs for Conservation. Working with these partners, PDPI has aimed to increase international awareness and conservation support for the species by creating an educational/fundraising campaign for painted dogs through zoo related events, through the establishment of a painted dog conservation website and social media presence, and by utilizing the proceeds of the zoo events and online outreach/marketing to fund the research, re-design, and implementation of enhanced anti-snare and reflective collars.